E-biking with Hotel Aak, Åndalsnes. Go electric – by train, on super silent sightseeing boats or in a shiny Tesla. Go healthy – eat local food from enthusiastic farmers and award-winning restaurants. Go green – and discover the wonderful people and places in Norway that give you the little extra and make you feel great! Travelling to Norway by train is a fantastic way to start your sustainable journey. Oslo has train connections to many European cities via Copenhagen in Denmark, and it is also easy to take the train from Gothenburg and Stockholm in Sweden. In addition, these and many other cities have good bus connections to Norway. If you want to go by boat, several ferry providers from Denmark, Sweden, and Germany have upgraded to more environmentally-friendly fuel. When docked in Oslo and Kristiansand, the majority of these ferries are now connected to land-power to lower emissions. But as Norway is a very long and rugged country, there are some destinations where flying there will be the most convenient, and sometimes only, option. To compensate for the environmental impact, you can donate money to organisations that work with climate protection programs. Read more about getting to Norway. The best way to explore the nooks and crannies of Norway is by public transport, and the train is the most environmentally-friendly option. And not only that – train journeys like the Bergen Railway, the Rauma Railway, the Nordland Railway, and the Ofoten Line are amongst the most beautiful in the world! You can also easily visit amazing destinations by the fjords or in the mountains and valleys by bus or boat. If you wish to explore the Norwegian coastline, local ferries make it convenient to go island hopping from major ports in Bergen, Ålesund, Kristiansund, Trondheim, and Bodø. The travel planner Entur provides you with an overview of timetables and routes, and several destinations offer pre-planned round trip passes and travel passes. If you wish to embark on an epic road trip by yourself, you can easily do so in an electric car, whether it is a rental or your own. There are more than 10,000 charging stations across Norway, and the number is still rising. If you drive a Tesla you can use their fast-charging stations. Moreover, several hotels have designated charging stalls in their car parks. 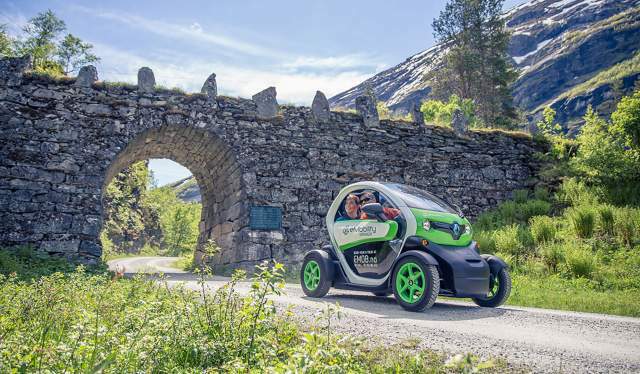 In Oslo, you can explore the city with an electric city-car from Greenmobile, and in Geiranger and Flåm you can get from A to B in a mini electric car provided by eMobility. Find charging stations at ladestasjoner.no (only in Norwegian) and get general EV information on elbil.no to plan your journey. If you choose to travel to a Sustainable Destination, you help preserve the historical and cultural heritage, and at the same time support the communities, traditions, nature, and environment. Welcoming hosts will serve food that is harvested, produced and prepared in the area. Sustainable Destination is the Nordic region’s only national labelling scheme for travel destinations. It is a tool for sustainable development of businesses and destinations when it comes to the environment, the local community, the cultural heritage, and the economy. However, the label does not mean that the destinations are 100 per cent sustainable, but that they have begun a long-term process. The destinations are evaluated every three years. On Visitnorway.com, the Tussock – the label for Green Travel – will guide you to eco-certified activities, restaurants, and accommodation. Enjoy the majestic landscape of the Norwegian coastline between Bergen and Kirkenes on more environmentally-friendly cruises by well-known operators that work closely with the local communities. Both on board the ships and when you disembark to explore, you get to savour the taste of Norway. In addition to the famous coastal express Hurtigruten, which has deep roots in the Norwegian coastal culture, there is also a new fish in town: Havila Kystruten will be offering cruises on the stretch between Bergen and Kirkenes from 2021, and their fleet consists of ships that run purely on battery and LNG (liquified natural gas) engines. In Norway, several destinations strive to improve their environmental impact and ensure that you get the most amazing and unique experiences you ever dreamt of. These places are part of the environmental scheme Sustainable Destination which focuses on developing responsible tourism across Norway. They also aim to strengthen the values of both the local culture and the community, making them a great place both to live in and to visit. You will also find many eco-certified tour operators all over the country. Oslo has some of the most innovative environmental solutions in Europe and is selected as the European Green Capital 2019. Experience the new face of the city by the fjord and find out why several international travel experts, such as Lonely Planet, have crowned Oslo one of the top cities to visit in the world. Follow the harbour promenade to celebrated restaurants, a city farm, floating saunas in the fjord, and exciting museums. Rent a kayak, bike or electric bike and explore the city. The big-city-feeling can easily be exchanged with the tranquillity of green spaces, as two-thirds of the capital’s area consists of woods and water. To make sure you get a good night’s sleep, choose eco-labelled accommodation. These places work tirelessly not only to maintain low energy consumption but also to come up with creative ways to prevent food wastage and take advantage of leftovers. One of the world’s most environmentally friendly hotels is Svart which will open near the Svartisen glacier in Holandsfjorden, Northern Norway in 2021. The circle shaped hotel will be the world’s first energy-positive hotel. Svart hotel under the northern lights, Northern Norway. Cycling to Svart hotel, Northern Norway. Norway is the amusement park of countries, and there are many fun ways to explore new destinations. Use your own strength and go hiking, cycling, skiing, climbing or kayaking, or enjoy other outdoor activities. From the far south to the northernmost point, you can go on guided tours. And if you haven’t brought your own equipment, you can usually rent some. If you want some motorised help, you can rent electric bikes, Segways or other means of transportation that will get you from A to B with little or no effort on your part. Or maybe real horsepower is more your style? Gallop across white sandy beaches or vast mountain plateaus, either on your own or with a guide. Experience the magnificent fjords or go whale watching on award-winning quiet-running hybrid or electric ships. With their innovative boats, The Fjords offer sightseeing trips on the Oslofjord during winter and the world heritage sites in Fjord Norway all year round. You can also explore the fjords on the west coast in the world’s first electrical RIB departing from Hellesylt. Further north, you can embark on the hybrid vessel Brim Explorer and cruise through Lofoten in the summertime or go on a winter whale safari in Tromsø. Green travelling includes trying out fresh local delicacies. Gorge on wild berries and the rich taste of slow-growing vegetables. Taste milk, cheese, and meat from sheep, goats, and cows that wander the mountainsides every summer. Catch your own fish or enjoy one that has been prepared by renowned chefs. More and more Norwegian restaurants go sustainable, and the majority offer exquisite vegetarian dishes as well as local meat. Try Himkok, a bar in Oslo that was awarded “The worlds most sustainable bar” in 2018, or Credo restaurant in Trondheim which received the first Michelin Nordic Guide Sustainability Award in 2019. Not to mention Rest, a unique restaurant in Oslo that turns leftovers into world-class gourmet meals. And by the way – did you know that the delicious Norwegian water is totally free? Get it straight from the tap or a mountain stream. Find sustainable things to do all over Norway.